The Regional Synod agreed on the theological position statemant "On Encounter with Muslims". The position statement declares that “Jesus Christ himself approached with love a wide range of people and in so doing is an example for us in our encounter with Muslims”. 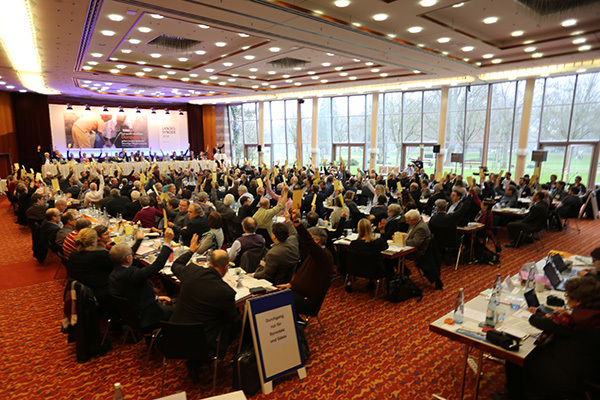 The Synod of the Evangelical Church in the Rhineland encourages Christians to be frank and outspoken in expressing their faith. An aim of Muslim-Christian dialogue is for “getting to know more about one another, working together, tolerating our differences along with a deeper understanding of our respective traditions, but it is not about conversion to the other religion”. In this theological position statement the Synod also affirms that it recognises the faith of the Muslim people as a commitment to the one God. For the Synod, the basis for theological conversations with Muslims lies in the relationship of both religions to the “biblical traditions, within which Muslims evaluate Jesus as a special prophet and whose life demonstrates God’s justice and mercy.” What we have in common and our differences need to be openly spoken about in the process. The theological position statement goes on to describe our common responsibility for community life, a commitment against all forms of racism, antisemitism, islamophobia, religious extremism and fundamentalism. It expresses support for Islamic education as a normal topic of education and encourages intercultural openness in relation to employment law. In adopting its position statement “On encounter with Muslims” the Synod also wished to promote “encouragement for and an orientation towards encounter”, as was explained by Superintendent Dr Ilka Werner, Chair of the Theological Committee of the Rhineland Church, at the opening of the Synod. The text presented today is seen as a milestone for the Christian-Muslim dialogue that has already been going on for more than forty years and which is planned to continue. The position statement is therefore seen as an express impulse for ongoing work. The Church executive board is asked to make an evaluation of the responses to the discussion paper issued in 2015 on “Being a community on the way and our witness in dialogue with Muslims”. Theological Position Statement "On Encounter with Muslims"